When Bla1ze first blogged about the public beta for SmrtGuard back in March it got a huge response from the CrackBerry community. SmrtGuard worked with thousands of beta testers in both their private and public betas to refine the solution and just this week have officially made SmrtGuard availabe for purchase. To kick things off, they're also giving the first 1,000 users the chance to win a Nintendo Wii! 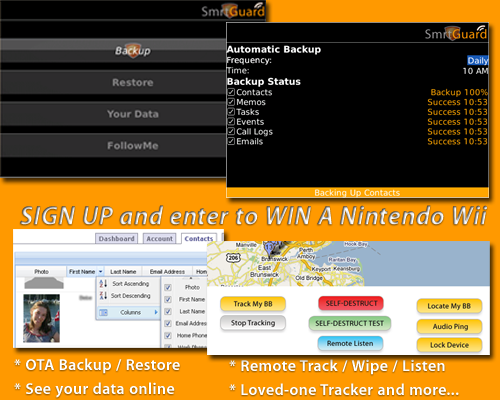 If you're not familiar with SmrtGuard, you can check out the video below and jump over to SmrtGuard.com to get all the details. For BlackBerry BIS subscribers, SmrtGuard makes it easy to back up the data on your BlackBerry and in the event of your BlackBerry getting lost or stolen provides a number of tools to help address the situation, including remote tracking and remote wiping of the handheld. For just a few bucks a month, it's definitely a worthwhile insurance policy of sorts to have on for what many is their most valuable asset (not just in terms of the the cost of the device, but what you keep on it! ).